Passive Intermodulation testing (PIM) is fast becoming a commonly accepted test to ensure the performance of cell systems. As technology advances and data rates increase, system performance is becoming more and more critical. Having the right test equipment will be paramount to maximizing site and system efficiency as subscriber traffic increases. 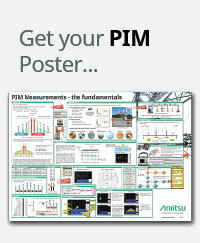 Anritsu has developed the PIM Master to verify if receiver interference at a cell site is due to an intermodulation product of two or more transmit frequencies, also known as passive intermodulation (PIM).